My teenaged daughter just asked me when our yard was going to look “nice” again. Inch by inch, I’ve been removing grass and replacing it with clover, herbs, milkweeds and some plants that I refer to, mostly ironically, as crops. She dislikes the rows of composting sod, the dying grass, and the soggy trenches that scream “work in progress.” “It’s so ugly,” she said. And then she cried. I had made The Classic Error—I didn’t get community buy-in on my gardening plans. Not only that, I am guilty of Error Number Two: I planted food that I enjoy— tomatillos, cilantro, sunchokes—but that my kids refuse to recognize as edible. 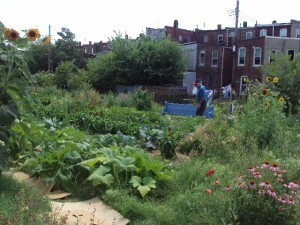 A new review from the Johns Hopkins Center for a Livable Future, Vacant Lots to Vibrant Plots, has brought together much of the existing research on urban farming and community gardening and identified not only the motivations for urban ag, but also what are—according to the literature—aspirations backed by evidence, and what is the stuff dreams are made of. The review contains a lot of depth. For those in DRTL mode, here’s a short, simplified breakdown of what’s reasonable to expect from your urban garden, what’s not reasonable, and how to (maybe) avoid making mistakes. Create self-reliant neighborhoods that produce a significant percent of the food they eat. Exclusion. When urban ag initiatives are led by young, white non-residents in predominantly minority neighborhoods, they can unintentionally exclude people of color and residents from participating in or benefitting from the garden or farm. Discrimination. When urban ag initiatives are led by lower-income residents and people of color, those residents experience disparities in access to land, government funding, and political support compared to the efforts led by white and middle-class groups. Gentrification. Residents in lower-income communities fear (often rightfully so) that urban gardens will make their neighborhoods more attractive to developers and increase property values—which makes rents and property taxes go up, and might result in displacing residents who can no longer afford to live there. Here are two CLF posts that address this issue: Urban Farms and the Lawyer Who Help Them and Cultivating Food Security in West Oakland. Inefficiency. Some well-intentioned urban gardening schemes may actually use resources like water and energy more inefficiently than large-scale operations. For a look at one example of this phenomenon in which a Zone 7 aquaponics farm used unsustainable energy to heat in winter, read Lessons Learned: Aquaponics in Baltimore. So what’s a well-intentioned urban farmer to do? Get buy-in. Talk to people who live in the neighborhood where you want to garden or farm. Go to some community meetings. Find out if they want a garden of farm, and if they do, find out what kind of plants they’d enjoy. Empower residents. The people who live in the neighborhood should be empowered in farm leadership and decision-making. Engage in the community. Don’t be a commuter—invest in making sure your garden or farm, and the neighborhood, receives maximum protection and support available from government agencies and funders. Go easy with the compost, fertilizer, and pesticides. Sometimes urban gardeners pollute more than they mean to. Conserve water. Be mindful of water use when irrigating crops, especially in water-scarce regions. Consider transport. How are you transporting the food you grow, and how far? Studies are showing that farming on a small scale results in a less efficient use of resources, so think about how to achieve economy of scale, or use energy-efficient transport. Monitor resource use. Vertical farms, greenhouses, hydroponics and aquaponics—they all sound so cool. But these could be resource-intensive operations, depending on where you live. For example, how much energy are you using to artificially light that vertical farm, or how much energy are you using to heat that aquaponics facility? Be soil-safe. Investigate the history of the land that you’re planting in. You never know if it was once a gas station, for example, or a dry cleaners, or a municipal dump—all of which might have left behind some nasty chemicals. Use this Soil Safety Guide from CLF to help with that. Be realistic about food supply. Your urban garden isn’t going to feed the neighborhood.. Studies modeling the potential of urban and peri-urban agriculture show that in densely populated cities, like New York, even if every acre of available land were used for farming, those farms will far short by a lot. In sparsely populated cities, like Cleveland or Detroit, the goal of self-reliance is more feasible. Focus. When building your garden, hang your hat on the mental health benefits, the connection to nature, and the opportunity to build and blend communities. Remember, there are a lot of opportunities for further research with urban agriculture, and a lot of benefits to be enjoyed. Go out there and dig.